Archeologists often struggle to find fossil evidence pertaining to the evolution of the brain. Thoughts are a hard thing to fossilize. However, John Hoffecker claims that this is not the case and fossils and archaeological evidence for the evolution of the human mind are abundant. Hoffecker has developed a concept which he calls the “super-brain” which he hypothesises emerged in Africa some 75,000 years ago. He claims that human’s ability to share thoughts between individuals is analogous to the abilities of honey bees who are able to communicate the location of food both in terms of distance and direction. They do this using a waggle-dance. Humans are able to share thoughts between brains using communicative methods, the most obvious of these being language. 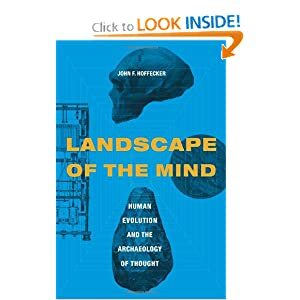 Hoffecker also hypothesises that his concept of the super-brain is likely to be connected to things like bipedalism and tool making. He claims that it was tool making which helped early humans first develop the ability to represent complex thoughts to others. He claims that tools were a consequence of bipedalism as this freed up the hands to make and use tools. Hoffecker pin points his “super-brain” as beginning to emerge 1.6 million years ago when the first hand axes began to appear in the fossil record. This is because hand axes are thought to be an external realisation of human thought as they bear little resemblance to the natural objects they were made from. By 75,00 years ago humans were producing perforated shell ornaments, polished bone awls and simple geometric designs incised into lumps of red ochre. Hoeffecker also lead a study in 2007 that discovered a carved piece of mammoth ivory that appears to be the head of a small figurine dating to more than 40,000 years ago. This is claimed to be the oldest piece of figurative art ever discovered. Finds like this illustrate the creative mind of humans as they spread out of Africa. Figurative art and musical instruments which date back to before 30,000 years ago have also been discovered in caves in France and Germany. This looks to be nothing new but archaeological evidence is something which a lot of people interested in language evolution do not often discuss. I also don’t really know what to think of Hoeffecker’s claim that “all languages basically have the same structure”. What do you think? If we assume for a second the innatist position – that language is more a product of genetic evolution – then must it follow that all languages have a common ancestor in Africa? If this was not the case and populations evolved an innate grammar separately then we would perhaps expect to find that different populations have different proclivities towards different types of languages. It seems to me, however, that the cultural position is more compatible with languages having fundamentally different structures: i.e. humans left Africa with the same general cognitive machinery, but different types of linguistic structure emerged under cultural evolution. So I wonder if the “all languages basically have the same structure” assertion is a little bit more on the innatist side of the debate. Although I guess that either genetic or cultural evolution could have converged on the same optimal solutions, giving the appearance that languages all have basically the same linguistic structure. He’s probably thinking along the lines of UG. That or something evolved to enable the human brain to create language in response to certain social conditions. They did this at least once some 50kya, and many times since when deaf people, using the same brains and in response to the same social conditions, created new languages, most recently ISN in Nicaragua. Languages demonstrably have “evolved independently at different times and places” and at a sufficiently abstract level, as he says “all languages have basically the same structure”. Thus if we want to know how language originated, unless there have been significant evolutionary changes in the human brain over the past 50k years all we have to do is look at Nicaragua. It’s really difficult (and possibly unfair) to judge basing on just a short description, but it seems like a weird combination of those old ideas that just happened to be around. E.g. language is nothing like bee dance – if it is to you, there’s something seriously wrong with your descriptive apparatus. If you subsume language and dyes as instances of the same class, ‘symbolic behaviour’, you need to re-check your definition of ‘symbols’. ‘Toolmaking’ would have to be made much more precise as well. Etc. etc. In general, it’s a well-known feature of the archaeological record to produce a small sensation every few years that cannot be integrated with the rest and pushes the dates back (latest example (McPherron et al 2010) – 3.4 MYA cut marks on bone), so at least to me this kind of ground is way too shaky for basing anythng solid on. He claims that human’s ability to share thoughts between individuals is analogous to the abilities of honey bees who are able to communicate the location of food both in terms of distance and direction. They do this using a waggle-dance. Humans are able to share thoughts between brains using communicative methods, the most obvious of these being language. Hmmm . . . Catchy idea. I wonder if he read my remarks on the busy bee brain? Or this closely related one on group intentionality?